Walter Foster was General Secretary of the Anglo-Austrian Society, which was founded in 1944, originally to further the re-establishment of a free, independent and democratic state of Austria. At the end of the Second World War, the Society devoted itself to relief work, bringing many hundreds of needy Austrian children to Britain for respite care, an activity repeated in 1955, when Austria finally gained full independence. The Society was independent and non-political but enjoyed the active support of all of the major political parties from both Houses of Parliament and from the Austrian Government. The Anglo-Austrian Music Society was devoted to re-establishing cultural links broken by the War and was instrumental in organising the first visits to this country of the Vienna State Opera, the Vienna Philharmonic Orchestra, the Vienna Boys Choir and of many well-known Austrian personalities in music, literature and the arts. Walter Foster joined the Anglo-Austrian Society in 1950 as assistant to Otto Harpner, whose untimely death in 1959 led to Foster becoming joint then general secretary of the Society, a role to which he dedicated his life until his retirement in 1992. The Society promoted friendship and understanding between the peoples of Great Britain and Austria through personal contacts and cultural exchanges. At the peak of the Society's activities, at the end of the 1960s and in the early 1970s, over 16,000 British and Austrian children and young people participated each year in exchange holidays, escorted travel between the two countries, educational visits, language courses, adventure holidays and student travel. Proceeds from these activities went to the Otto Harpner Memorial Fund, which made educational and holiday visits available to needy or physically handicapped children. The Music Society, effectively founded by Ferdinand Rauter to ensure work for refugee musicisns, later arranged performances by famous Austrian artists and ensembles in all parts of the British Isles. It sponsored and supported British and Austrian musicians and composers, arranging debut performances and commissioning new works. Income from concerts was used to fund the Richard Tauber memorial scholarship, originally established to assist young British singers to study in Vienna, and still awarding a major prize every two years to a young British or Austrian singer. New commissioned works first performed under the auspices of the Society included pieces from Benjamin Britten, Peter Maxwell Davies, Harrison Birtwistle, Thea Musgrave and John Tavener, while debut performances included those of Paul Badura-Skoda, Heinrich Schiff, The Alban Berg Quartet, Edita Gruberova and many others. Further income to support the activities of the Society was generated by several very successful visits to Britain of the Vienna Volksoper and Ballet and of the Spanish Riding School of Vienna, with its world-famous Lipizzaner stallions. Walter Foster was born Walter Fast in Vienna in 1923, second child to educated, liberal parents who actively supported the Wiener Werkstaette, filling their home with artworks and craftsmanship. His entrepreneurial and philanthropic father, a criminal lawyer by training, established an early system for day-release of prisoners, working for a proper wage in his own craft factory, which made all things in wood from precision drawing instruments to flat-pack prefabricated timber holiday homes. 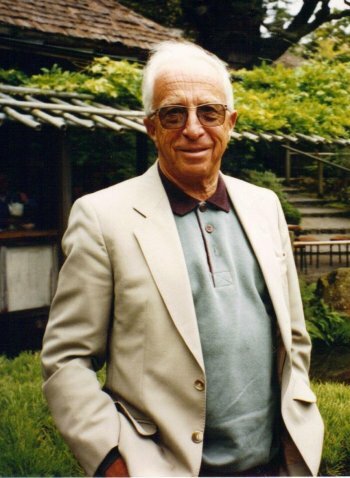 As a boy, Walter Fast experienced first-hand the turbulent times of civil war, Dollfuss, Schuschnigg and the Anschluss of Austria by Nazi Germany, culminating in his departure as a refugee to England by Kindertransport arriving at Harwich on 20 December 1938, leaving his parents behind and separated from his elder brother, who went to the United States. His father survived the War in Palestine, but most of his relatives perished at the hands of the Nazis. At the outbreak of War he was first interned as an "enemy alien" on the Isle of Man and then sent around the world on the infamous prison ship Dunera, to be interned at Hay Camp, South Australia. After 18 months, with others he was granted leave to enlist and return to Britain, where he served with the Royal Electrical and Mechanical Engineers. 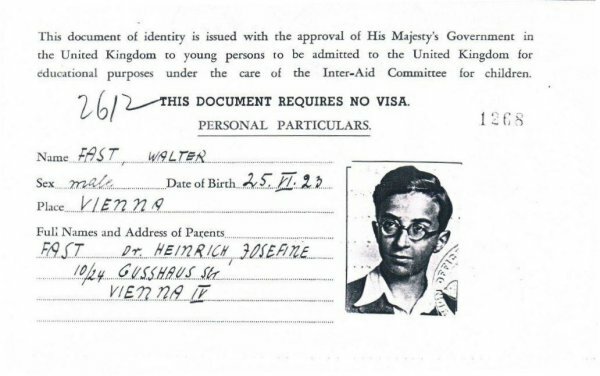 After naturalisation, when his name was changed to Foster, from 1945 he served as an interpreter with the occupation forces in Germany, returning to study international relations at the London School of Economics. His pre-War and Wartime experiences were recently recorded in interviews now held in the Imperial War Museum audio archives. At LSE he met people who were to be his friends and colleagues for the rest of his life, including Martin Ennals (later Secretary General of Amnesty International), who while working at NUS took an enquiry from the Anglo-Austrian Society, seeking a temporary assistant. At LSE he also met his wife, Rachel Ginsburg, who tirelessly and actively supported him throughout his career at the Anglo-Austrian Society. The temporary post within this organisation of energetic stalwarts, dedicated to the joint causes of helping the children of Austria and bringing Austrian musical culture to the enthusiastic audiences of the provincial towns and cities of Britain, as well as London, soon became permanent, with Foster becoming responsible for organising the childrens' travel, managing the concert tours and establishing an administrative structure for the endless enthusiasm of the others. Over two decades he gathered into the organisation a sequence of younger people, often newly graduated from university, who discovered and developed their own particular skills, working as a team, dealing with musicians, orchestras, opera and ballet companies, performance venues, schools, education authorities, railway and ferry companies, harbour authorities, airlines, government departments, town councils, diplomats, parliamentarians, military bands, folk-music ensembles, universities, student organisations and disability groups. It is remarkable that despite the experiences of his early years, Walter Foster never lost faith in Austria, but devoted his life to improving relations between Britain and Austria, particularly by bringing so many young people of both countries together, to break down barriers and to get a better understanding of each other. It takes an extraordinary man to spend his life working to promote better understanding between the people of a country from which he fled in fear of his life with the people of a country that imprisoned him on his arrival, yet that he forgave enough to make that country his home. He was a man of compassion, tolerance and understanding. Always seeking truth, he believed that anyone could learn and all could be taught. His wit, dry sense of humour and careful silences were used to impart quietly spoken wisdom, especially to his grandchildren, wanting them to know that it is possible to live in a decent society in a peaceful and good way, firmly believing that "all is for the best in this best of all possible worlds". Regularly travelling to Austria, he maintained his father's holiday home in the eastern Alps and educated his children and later his grandchildren, travelling several times a year by train and car between England and Austria on endlessly varied routes through Europe, by imparting his great knowledge of European history, art and culture, stopping at places of great interest along the way. His interest and enjoyment of the views of others, of music, art and theatre remained important to him until his last days. Foster was decorated for his services to the enhancement of cultural relationships between Britain and Austria, being awarded the OBE and Austria's Grosses Goldenes Ehrenzeichen. He was latterly elected a fellow of the Royal Society of Arts. Walter Foster OBE died on 27 December 2009, aged 86. He is survived by his wife, children and ten grandchildren.